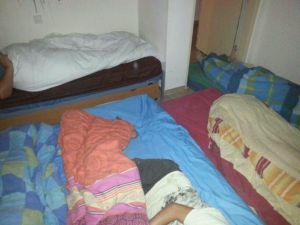 These conditions are not easy for these young adults, but at least we know that they are protected should a rocket fall. 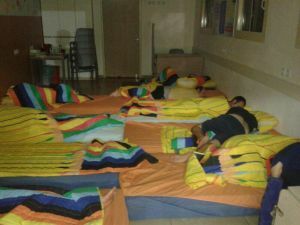 At the Homes for Life in the Village the low functioning autistic tenants sleep in the small shelter that is in each Home (see the attached photos). All summer camps that are in the areas “under-fire” were cancelled and the children have been staying at home. In the Village, we are operating a daily activity center for the staff's children so that the staff can come to work. ALUT has enlarged its staff at each of its ‘Homes for Life’ throughout the country. We are in constant communication and after each siren sounds in the different regions of the country, the staff of each ‘Home for Life’ in the relevant area updates ALUT's Headquarters about the tenants' emotional and physical condition and the state of the house after the rocket attack. ALUT's staff in all our family centers around the country call the families with an autistic child and check how they are managing with the security situation and if they need any assistance. Families from the south who wish to travel to quieter areas to rest a bit are able to receive help. The Alut family-to-family hot line works every day and the feedback from the staff indicates that the families are overwhelmingly excited and grateful that someone cares and is interested in their difficulties. And in the end, that is what ALUT is all about. Our dear friends, during these trying and difficult times, knowing that you care warms our hearts. We thank you for your support. Let's hope for a quick return to normal and quiet days.